A couple of weeks ago I went, with my sister and some friends, to Dignes les Bains, about 1 1/2 hours away in the Alpes foothills. There we visited a woman, Sandrine Pilati, who is a professional rabbit breeder and spinner of wool. Her atelier is in the little village of La Bégude outside of Dignes, as is the place where she keeps her rabbits. She used to have sheep as well, but local hunters chased her off the land and she had to give up her flock for lack of pasture. Her company is called “Laine des Alpes”. Sandrine generously showed us around and demonstrated various skills she has honed: carding, spinning and felting. A consummate craftsman, she does everything by hand. You can see a youtube feature on her and her rabbits here. 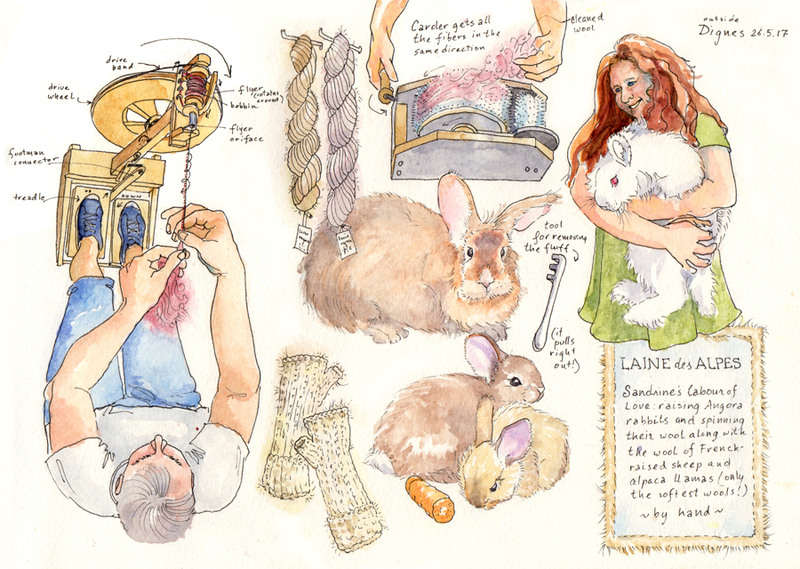 Since we were able to witness each stage of the process of producing Angora wool (the wool from these specially-bred rabbits), I’ll tell you about these. The rabbits are HUGE. Sandrine has about 35 of them, and breeds them for their colour and the silkiness of the fibre. The three I have drawn, mom and two babies, are of the silky variety. Their fur really gleams. All her Angora wool is super soft and non-itchy. According to Wikipedia, Angora wool is five times warmer than sheep wool. Before I go further, let me address the ethical issue. Most Angora wool is produced in China, where the animals are commercially raised and treated accordingly. Something I have always wondered about is how the fur is harvested. Here is a video of Sandrine removing the fur from her rabbit. Angora rabbits are a breed that could not exist in the wild. The animals’ fur is so long, if it is not removed periodically, it creates a massive rasta-style knot which can cause serious damage to the animal. Sometimes Sandrine just has to cut off the knots, if she doesn’t have the time, or it’s too cold (the rabbits can fall very sick from the thermal shock of losing all their fur when the ambient temperature is too cold). She pulled out a handful of fur from one of the rabbits and I could see it didn’t seem to mind. So, now we have the clumps of (not too clean) fur. Though lovely and soft, it needs to be organised before it is useful. After washing and drying the fibres, it gets treated with a carder. This device is 2 wheels covered with pins, one big, one small, that turn, gear-like, against each other. Sandrine “feeds” clumps of raw wool onto the large wheel, which catches on and pulls the fibres so they all face the same direction. With what looks like a cat-grooming brush, Sandrine controls the flow. She can introduce multiple colours at this point if she wants to create a heathered wool from the fur. She removes the reorganised fibres in manageable clumps. Next comes the spinning. I’ve drawn the mechanism as best I could. The wheel is driven by the treadle you work with your feet. The rotation created twirls the flyer and pulls the new formed thread onto the bobbin. A fairly simple, clever device. The missing element is the skill of the person in control. I know how challenging it is because Sandrine helped each of us give it a try. For one person, the tension between the hand that feeds out the wool and the hand that guides it to be twirled was too loose and the thread broke. For another, it was too tight and the thread just twirled and twirled before it got into the flyer oriface and onto the bobbin, thus becoming a ridiculously twisted snarl. For me, I couldn’t even get the treadles working— if you’re not consistent in the pressure, the wheel will spin clockwise and then counter-clockwise, thus undoing whatever you managed to feed into the flyer. When it’s done right, the correctly-twirled thread becomes a handsome and strong single-gage yarn. It is amazing how the twisting binds the fibres so effectively. If one wants to create a double-ply yarn (perhaps for a variegated effect with two colours), one feeds the two different-coloured yarns through again. Sandrine uses mostly naturally-coloured yarns (the colour of the animal), but also can dye the wool before or after the carding. She has a local knitter create a variety of garments. I fell in love with a neck warmer (Sandrine’s) the colour of a cappucino: one half made with the hairs of baby rabbit; the other half with the longer, darker fur of its mother. It takes a long while to get from rabbit to garment, but it will give me something to look forward to when the weather turns cold again.